Multihued lava rocks at the start of the spatter tube. High desert forest slopes looking south to Mt. Lassen. The morning of Day 63 we awoke to an old friend, frost. Although we were in the high desert, the air was crisp and chilly and our damp clothes from the night before were stiff with ice. Along with the past few cold mornings, it reminded us of we have ahead of us in the Sierra and why we are happy to be picking up our warmer clothes soon. Having completed our four long days to get across the Hat Creek Rim, we now have two much shorter and easier days before our resupply and zero near Chester, so it was OK that we took a bit longer to get organized this morning. We started in layers and were happy that sunlight hit us not long after we got on the trail. We crossed Hwy 44 then passed the Spatter Cone Nature trail. With our shorter mileage day we dropped our packs and took a brief side trip to see the spatter tube. This area is the origin of the lava flow that makes up Hat Creek Rim, and the tube was really cool. It is a series of hollow rocky tubes from which the lava flowed, and the lava rock surrounding it boasted some stupendous colors. By the time we were done with this little diversion we were ready to take off the extra layers and we headed back to the PCT and onwards to Lassen National Park. Huckleberry walking through Jeffrey pine forest. Hat Creek and the welcome sight of flowing water. We gained elevation fairly slowly and I was struck by the grey-white dusty volcanic earth. Despite it being nutrient poor, there were several green hues in this broad valley and up the adjacent gentle slopes. The Jeffrey pines above, the manzanitas around us, and the stretches of sagebrush were all different greens and it made for a picturesque landscape. As we continued our gradual climb, we passed through areas that had been harvested and replanted in very distinct rows. I imagined that from above this area would like a striped rugby jersey, with a deep green band of equally spaced young trees and then a yellowish-green band of old logging road being filled in with yellowing grasses and the darker green of manzanita. The pattern would repeat again and again. We also came across Hat Creek, whose fast-flowing water was a nice diversion from the dry landscape and the only running water we would see on-trail until we reached our campsite tonight. We walked alongside its banks for only a short time then the trail turned away from the rushing waters to cross several unpaved forest roads. Manzanita skeletons being overtaken by new growth. Dry grasses, wildflowers and the burned canopy of the Reading Fire. A few miles shy of the park's northern boundary, we entered another burn area. The Reading Fire occurred just 4 years ago and in this initial section we found abudant growth of new manzanitas. Around the pale burnt skeletons of the former shrubs there were 4-8 new shrubs growing from dropped berries. It was impressive to see how quickly this understory plant was recovering. At the boundary itself, there was a register and we saw several familiar names of both SOBOs and a few NOBOs we met in passing. In the park, there were some late season wildflowers in bloom including dwarf lupines, penstemons, and some yellow and purple asters. Happily there were also some new stands of lodgepole pine growing even in the midst of the burn zone. We caught intermittent glimpses of Mt. Lassen as we passed east of this volcano, but spent much of the afternoon walking through the extensive burn area over gently rolling terrain with many grassy meadows but few intact mature trees. That night we camped beside Summit Creek, a few miles south of a cluster of lakes that had also stayed outside of the burn. Our day of ~25 miles really felt like a holiday after the past several 30+ mile days, especially as we had set up camp and were making dinner well before dark. Around this time we heard voices across the creek and saw Neemor hiking with another SOBO, Grateful Red - we'd seen his name in the log at Cache 22 but had never met. We expected Neemor to still be ahead of us knowing he planned to resupply in Old Station, but it turns out he arrived over the holiday weekend and spent his extra time summitting Mt. Lassen yesterday while waiting for the post office to open at 11am today. Having hiked and camped alone since leaving Castella, it was good to see fellow SOBOs and we socialized for a bit before all heading to bed at hiker midnight. Morning golden hour in Warner Valley and Drakesbad. Boiling Springs Lake is spectacular. Macro, Grateful Red and Neemor. Guess who's still cold despite the sun and hydrothermal lake? Day 64 was a bit warmer as we broke camp, but we still started in layers. As we descended into the Warner Valley, there was the unusual sight of frost on the marsh plants contrasting with steam rising from the hydrothermally heated streams. Tempting as it was to put our hands in that water, we had no idea how hot it was and as the local dear seemed to be avoiding the streams, we followed their lead. Past Drakesbad Guest Ranch, we took another popular PCT alternate route to walk along the shore of Boiling Springs Lake. We could smell the hydrogen sulfide (rotten egg) smell before reaching this aqua green, milky-muddy and steaming hot lake. It was surrounded by purple, red, yellow, and white colored ground and ringed with Incense cedars, Ponderosa pines and Douglas firs. Steam rising from the lake swirled into small eddies in the crisp morning air. It was otherworldly beautiful. While we were there having a snack and enjoying the colors, Neemor and Grateful Red caught up to us. We chatted a while and took a bunch of pictures, then the four of us continued on the trail to where the trail rejoined the official PCT. Here we all decided to take a short spur trail to see Terminal Geyser. This is a large fumerole nestled near a small warm creek. We all enjoyed the view before heading back to the PCT and onwards. 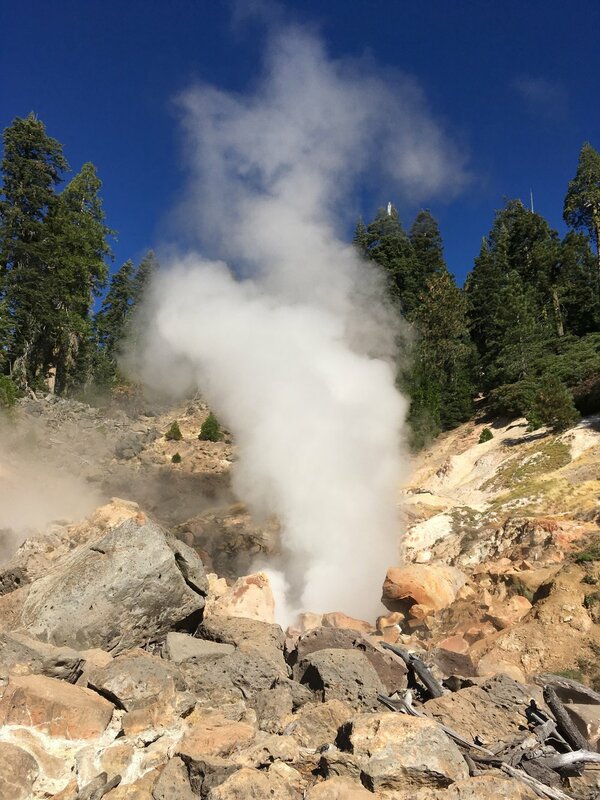 Terminal geyser, really a fumarole. There was a campsite about 20' away if you don't mind the rotten egg smell. On our way down the slope and only a mile from the park's southern boundary, we passed two park rangers. They asked if we were SOBOs, what our trail names were, and wished us well. Apparently, we didn't look too suspicious because 5 minutes later they grilled Neemor and Grateful Red about bear canisters and whether they were carrying them (none of us have picked ours up yet, though it seems that they are now required in Lassen unbeknownst to any thru-hikers). After crossing out of the park, we hiked for several miles with Neemor, as Grateful Red with his long strides soon disappeared up the trail. The three of us chatted about various topics and the miles passed quickly under our feet. 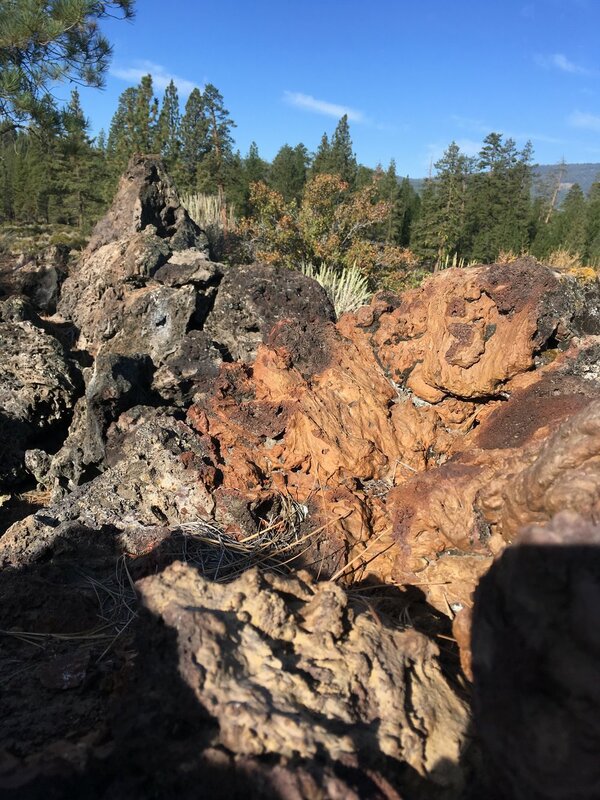 We all remarked that it was little odd that both Lassen and Crater Lake National Parks had several miles of flat, diseased or burned forest to walk through on the PCT before suddenly reaching the jaw-dropping features for which they are known. The surrounding USFS land seems much healthier with more vibrant forest than what is just inside the park. Perhaps it's just a coincidence. We crossed several unpaved roads and caught up to Grateful Red at some trail magic that had just been put out for SOBOs (!!) by a retired couple from Chester. We signed their book with a big thank-you and happily noshed on some snacks while sipping Capri Sun drinks through a straw. Not long after that we crossed the North Fork of the Feather River and started a long climb. Brokeoff Mtn and Mt Lassen. Long ago they were part of the same mega volcano. On the exposed slope we turned and suddenly had stupendous views of Brokeoff Mountain, Mt. Lassen and Childs Meadows. For Huckleberry and I it was especially fun to see Brokeoff Mountain, though it is a lesser-known peak than Lassen. She grew up in the area and we climbed Brokeoff with two of her young nieces and brother several summers ago. Seeing its jagged edge not far away reminded us of that fun day. Soon enough our vistas disappeared and we were back under the mixed forest canopy of Sugar pine and Incense cedar. The last few miles were over private (i.e. logging company) land with huge notices to watch for falling trees. While we could hear logging operations in action, no work was being done that we could see from the trail. We approached Hwy 36 and our meeting point to rendezvous with Huckleberry's parents a little early, thanks to Neemor's speedy pace. At the trailhead we met a couple who had just dropped off their daughter, Cookie, to complete her PCT hike (she walked from Canada to the halfway point last year, and is now headed from here to Mexico). They had driven her down from Anacortes, WA, hiked in 4-5 miles with her and now were preparing to head out. Happy to see fellow SOBOs, they asked us to keep an eye out for her and say hi, then surprised us with some home-grown apples before heading down the road. PCT or PC trail? Either way, we are approaching the ½ way point and are excited! Huckleberry's mum showed up not too long after that, with a feast of fresh fruit, yogurt, and cookies and ice cold water. Grateful Red had already headed south but Neemor got lucky with some extra treats and a water refill. We headed back to their home for the usual hot showers, a bed, and great food of a town stop but in addition will be taking our second zero day here to rest and catch up on life before we head back to the trail. A fitting way to celebrate the halfway-ish point of our journey. By the numbers: We reached Chester/Hwy 36, the general mid-point of the PCT, 2 months and a day after starting our hike and just shy of 2 months since turning south at the Canadian Border. In these 64 days we've hiked 1313 miles on the PCT and alternate routes, and another 51 bonus miles. The official PCT mid-point marker is 8.1 miles south of Hwy 36, but because the length of the trail changes every year (re-routes, detours, etc) the true mid-point also changes. For 2016 the PCT is 2650.1 miles long, and the true mid-point is 4.4 miles north of the marker. This doesn't account for alternate routes (most thru-hikers take at least some), and bonus miles, which are just that! In any case, we consider ourselves halfway through our journey.